Difference between Synchronous and Induction Motor. While studying Electrical Machines especially AC Machines, you might have come across the 2 types of motor that is synchronous and asynchronous motor. Of course the asynchronous motor is also called as induction motor. In this post we shall be comparing the two kinds of motor that is synchronous and induction motor. First of all talking about the synchronous motor. Speed: Starting from its name ‘synchronous’, this motor runs at synchronous speed whatever the amount of load it may be. The speed of this kind of motor is not dependent on the load. 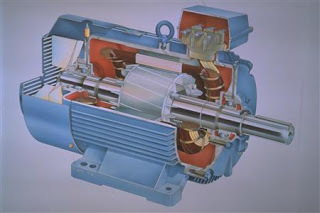 Starting Torque: This motor does not have any self starting torque, so some other auxiliary means have to be provided for starting the synchronous machine. Excitation: Synchronous motor is a doubly excited machine. The field winding that is rotor is excited using DC source and its stator that is armature winding is excited using AC source. In addition to that it can be made to operate at leading power factor from lagging power factor just by changing its excitation. Efficiency: This is comparatively more efficient than induction motor. Cost: This kind of motor is much costlier that a similar rating induction motor. Speed: The speed of induction motor is always less than the synchronous speed and it is dependent on the load since the speed decreases with the increase in load. Starting Torque: This kind of motor has its own self starting torque. Excitation: It is a singly excited machine where its stator windings are excited using an AC source. Contrary to the case of synchronous motor, induction motor works only under lagging power factor. Efficiency: It is comparatively less efficient. Cost: The cost of induction machine is less when compared with a synchronous motor of same rating. Hello to all, how is the whole thing, I think every one is getting more from this web site, and your views are fastidious in favor of new people. I want difference between DC,synchronous and induction motor?????? ?